"Long before Hank the Cowdog was patrolling the ranch, his daddy was getting a first-hand look at the history of his home region. Now, fans of author John R. Erickson can get a look at his first book, reissued by the University of North Texas Press for the first time since 1995. 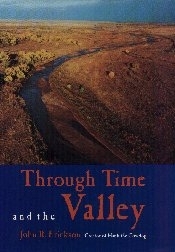 “Through Time and the Valley” was first published in 1978, capturing Erickson’s 15-day horseback expedition down the Canadian River from Plemons to the Oklahoma border and back to Canadian. In the book, now available in stores and online, Erickson describes his journey along the oft-dry river with photographer and friend Bill Ellzey. Read the article: Author of 'Hank the Cowdog' Reissues First Book"